Over on Instagram I’m taking part in a 30 day long photo challenge (#30daysofcraftiness). On Monday the theme was ‘materials’. 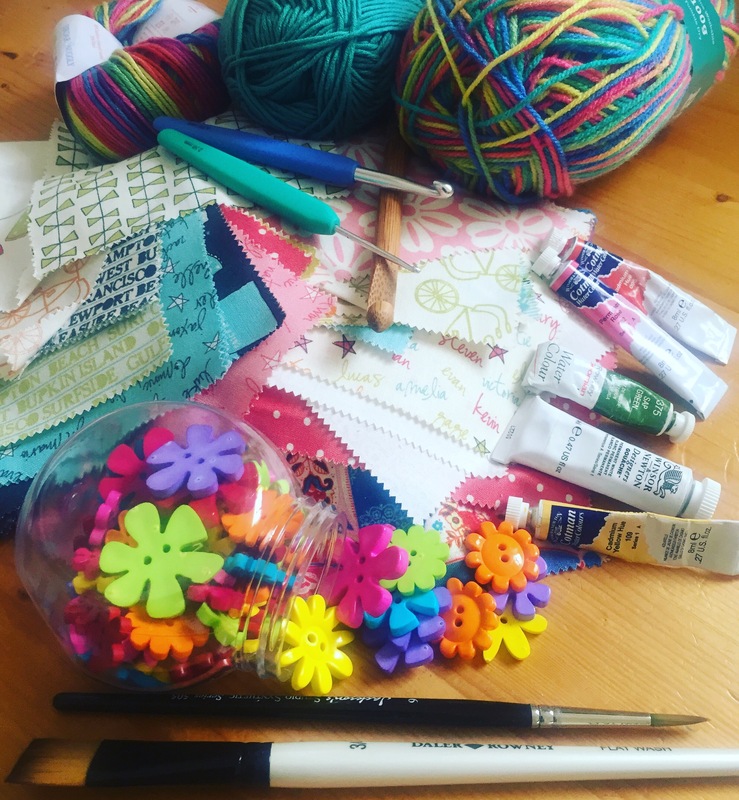 It was such a gloomy, wet & windy day I chose rainbow bright yarn, fabric, paints and buttons to cheer myself up. I thought I’d share them with you! Home furnishings WARNING: bland photo alert! Med steps training I’ve only managed one trip up the steps so far this week, I’m hoping to fit another one in this afternoon. Thursday was a stunningly beautiful day and as I set off at 10am the sun was already rather hot making it harder work than my previous recent attempts. 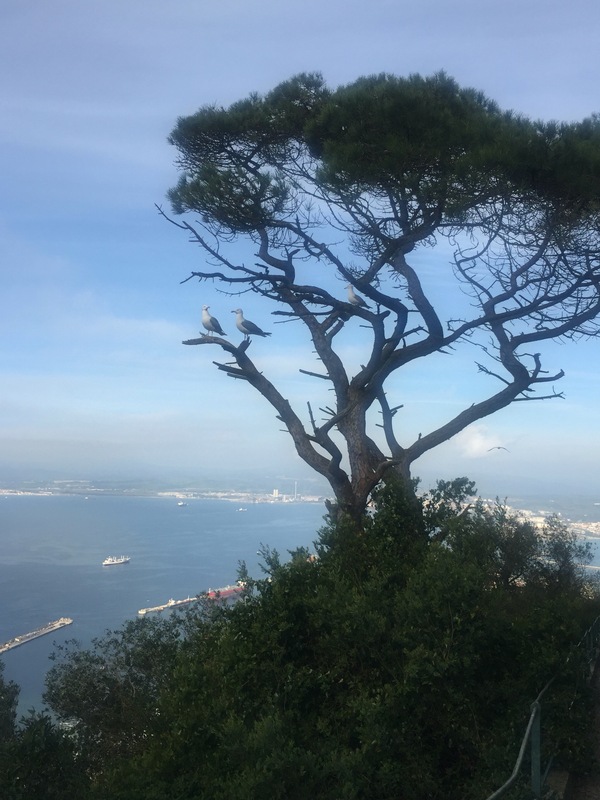 These seagulls were taking in the view of the Bay on my descent. 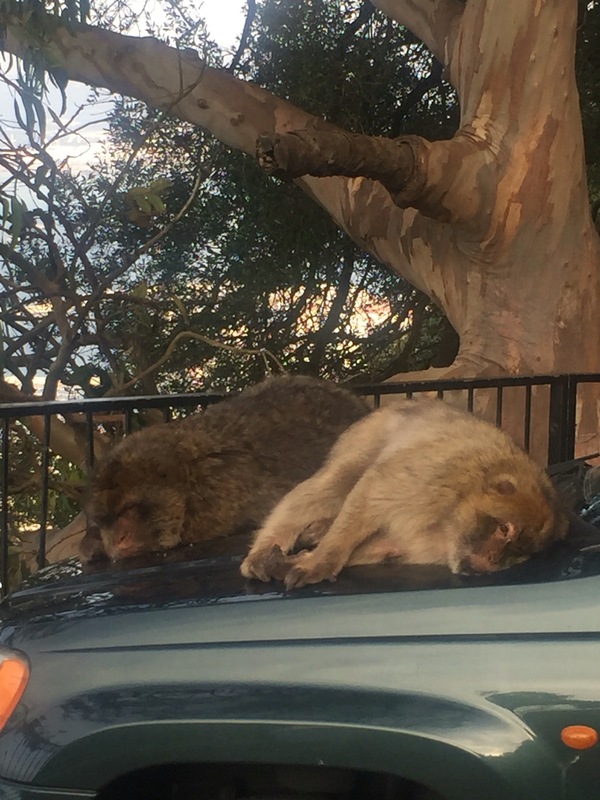 On my way back down from the top of the Rock I spotted these two large apes having a snooze on the bonnet of a car. I felt like having a lie down myself after that big climb! Watercolour class Oh how I have missed my painting these last few weeks over the Christmas break. My class restarted this week and my word it was utterly fantastic to sit down and get totally immersed in something calming and peaceful. It’s been a bit hectic for us lately and my head has been so busy with lots of thoughts about what I need to do and where I need to be etc etc. I really loved it! The above painting will hopefully resemble a doorway once it’s finished. The cling film on the wet paint should create a stripy effect on the door. 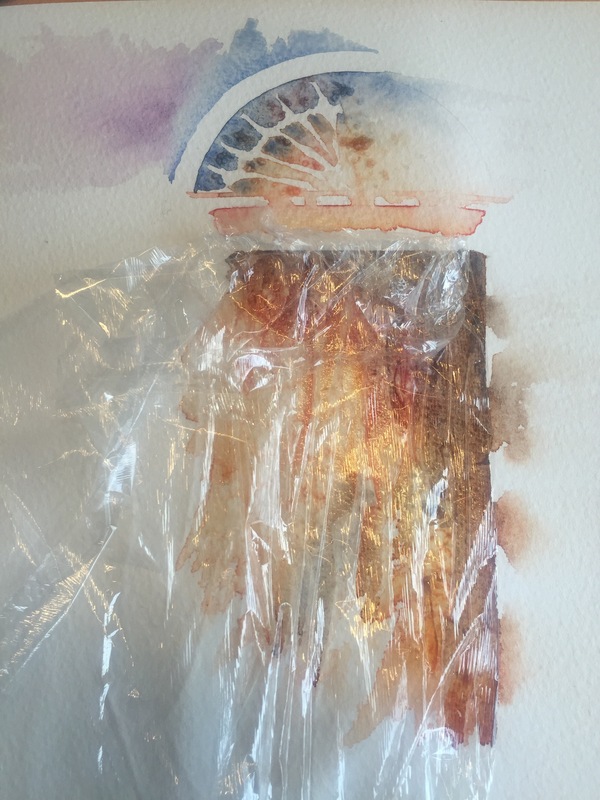 I’m following a technique in a Jean Haines book (which my teacher has) to create a very loose impressionistic style. Time will tell if I achieve it! Tulips I treated myself to a bunch of these beauties this week at the supermarket- aren’t they gorgeous? 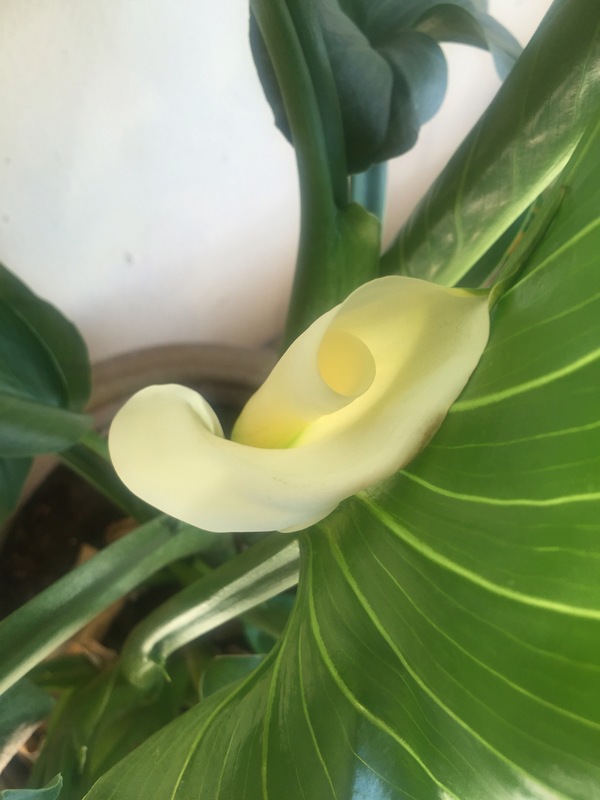 New flower Out on our balcony yesterday afternoon I was having a bit of a potter and I lifted a leaf to find this lovely surprise hiding underneath. I do love these lilies, they were a gift from a friend who lives across the border in Spain. I have tried growing them several times from the corm or bulb but with limited success. This Spanish clump though has never let me down. I hope you have had a good week, thank you for stopping by to visit 🙂 . Sunday Sevens is a weekly blog series created by Natalie at Threads & Bobbins. Love the colourful materials pic. Um, machine stitching the seams? The only thing I machine are the joins (although I’ve done that by hand) and the linings. But apart from the tape at the top, all the rest of the main curtain I do by hand, and join the lining by hand too. Just took one down yesterday to wash. Having a redec. We’re being taught to do it by machine. Doesn’t it take an age to hand sew the seams? Good luck with the redecorating 🙂 I love the tulips! Actually no it doesn’t. And, for me it was easier to handle as I made floor-length curtains. Nightmare to push through a small machine. 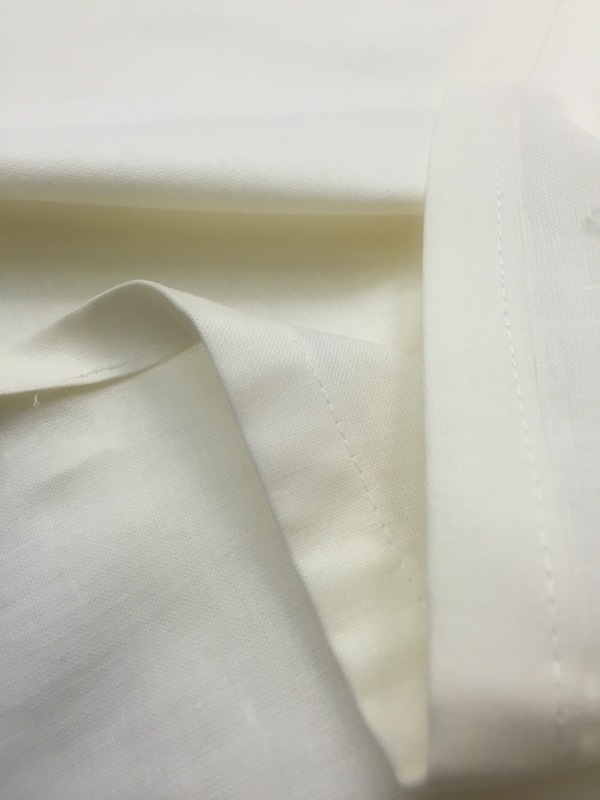 How do you manage the mitreing if you machine stitch? Redec isn’t too difficult for me. I married a decorator 😀 But it does mean the whole room gets a thorough clean first, so that’s my drudgery contribution. Here’s where I come across as a complete dunce – I wouldn’t know a mitre if it jumped up and bit me. That’s why I’m on a beginner’s course! If we reach that stage I’ll let you know. You are so lucky having a decorator for a husband. I’m afraid such things fall to me or we have to get someone in to do it. In fact I have 2 pairs of shutters which need sanding, undercoating and glossing. I was supposed to start that today…. Better get on with it! Love love love your painting! 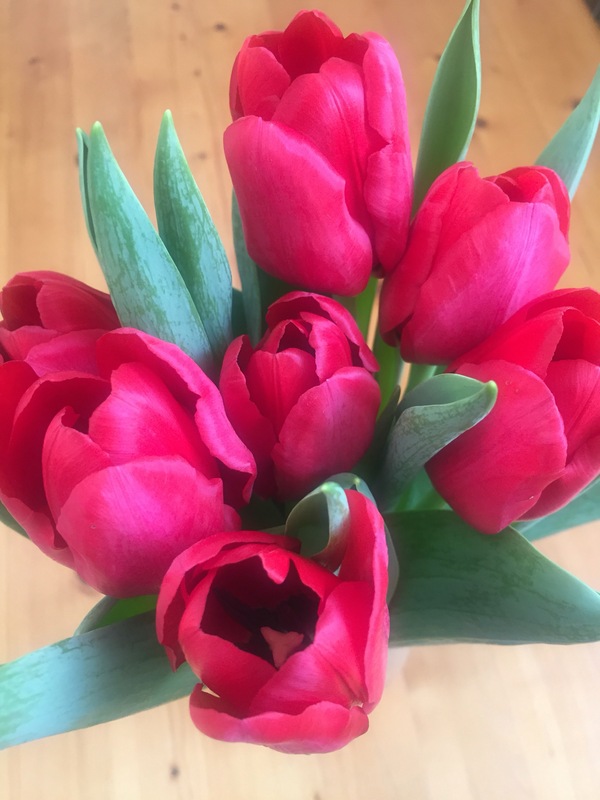 Tulips are so pretty. Thanks for sharing this challenge. After 3 months doing the #planwithmechallenge on Instagram I need something new for next month. Lots of lovely images this week, especially enjoying the view from the steps and the tulips. Hi! I have been following your blog for some time now and I really enjoy your Sunday 7. I just moved to Gibraltar in December, so everything is new to me. But something that I’m really interested in, is where I find more information about those classes you are taking. I find it hard to figure out, what possible classes there are here. It is like there is no combined place or website were I can have a overview. I hope you can help me. I love the way your painting is progressing – just the style I’d choose. Keep up the training good work! A lovely way to present your Sunday Sevens 🙂 Those apes are hilarious! Your materials photo is a lovely one, very colourful indeed! Remember, one trip up the steps is definitely better than none at all 🙂 Keep going! The view from the steps is stunning! I’m almost surprised the apes weren’t at the top enjoying the view, but then, I suppose the shade is nicer for napping. Good job keeping up with that (every little bit helps). So curious to see how your painting comes out – the colors are wonderful!